The leader of the Indigenous People of Biafra Mazi Nnamdi Kanu who was arrested in 2015 by the Nigeria DSS, who also is currently facing trial in the federal high court Abuja with treasonable charges, have once again during his trial on 10th January 2017 rejected secret trial and masked witnesses. The development took place in the court room when Justice Binta Nyako who is the trial judge carved out a secret scene in the court room where the secret trial will commence. According to Mazi Nnamdi Kanu who voiced out in anger; he said he will never accept secret trial neither will he allow anyone to testify against him with mask. Right there in the court room, he cited an example with the case of Obafemi Awolowo who committed treason and asked the judge if Awolowo was tried secretly despite the fact the he was charged with treason back then. Note: Obafemi Awolowo was charged with treason while he (Nnamdi Kanu) is currently facing the charges of treasonable felony. In addition, Mazi Nnamdi Kanu told the Judge and the masses that he was accused openly and should be tried publicly. According to him, "If anyone think he or she have genuine facts to testify against me, let he or she do it openly without mask in other to show and prove that what he or she is testifying against me of is nothing but the truth". This latest development in the federal high court Abuja on the 10th of January that forced Justice Binta Nyako to run out of the court room has raised different reactions from different people and the masses. 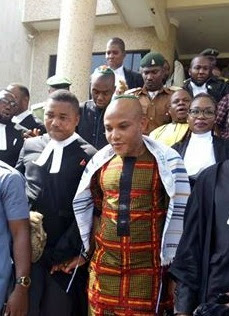 We can recall that when Binta Nyako first ruled for secret trial, Nnamdi Kanu and the world at large condemned it but the inhumane and rude attitude of justice Binta Nyako and the Federal government of Nigeria to proceed with it clearly portrayed how politicized the Nigeria Judiciary is and how tyrant and undemocratic Nigeria is. The stand of Mazi Nnamdi Kanu against secret trial really got the backing of many people around the world. While others say it's not in line with the judicial process of a country where there is common law, others are calling it an illegal trial and proceeding in the Nigeria judicial process. And this is a prove that Justice Binta Nyako who despite the total rejection of secret trial and masked witnesses by the Masses and the accused, still proceed with her ruling is working for the Federal Government of Nigeria led by Muhammadu Buhari who is determined at all means to illegally jail Mazi Nnamdi Kanu. What the case may be, Nnamdi Kanu said no to secret trial and masked witnesses and the masses that honestly stand with the truth and honesty also stand strong with him.